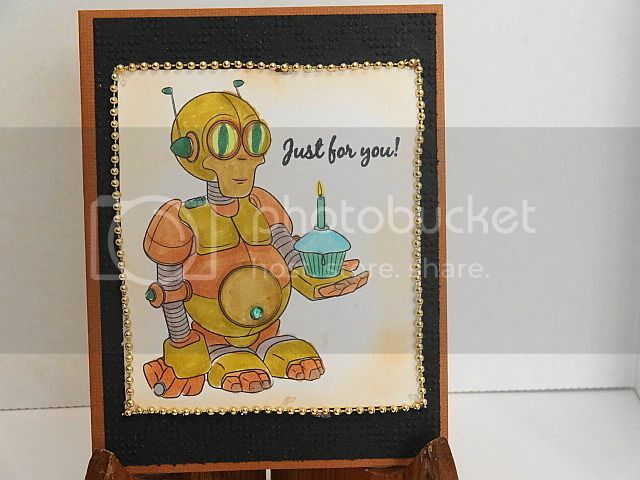 I was thinking a gold robot and I use Tim Holtz tea die distress ink for the edges. I really need to practice that technique more. I used a dobber. I'm just too heavy handed with the dobber. I used a green gem for the belly button and took gold bead chain from my stash to frame it so it didn't look so bad. 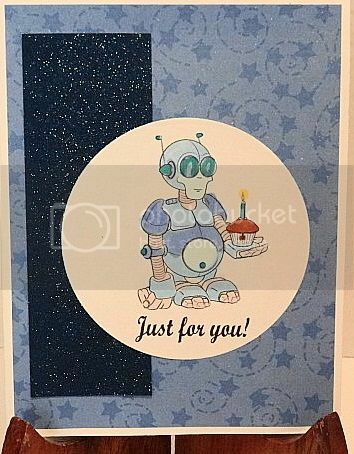 Although it could be saying the robot burnt the cake and came back with the cupcake. LOL. I used Spectrum Noir Markers GB10,11, JG2, TN5, FL3, BG3,CT4, GT2, IB2, GT2. The sentiment was from the stamp set Simple Said from CardzTV. I used the cuttlebug embossing folder Charles. Here is my second attempt. I went simple this time without the distress ink. The sparkle dark blue paper from DCWV glitter pack. The light blue is also from DCWV. The Spectrum Noir markers I used were IG1, BT4, TB2,3, TN6 and the sentiment was also from CardzTV. Thanks for stopping by today I love reading your comments. Both of your cards are so sweet!!! I Miss My Spectrum Noir Markers.